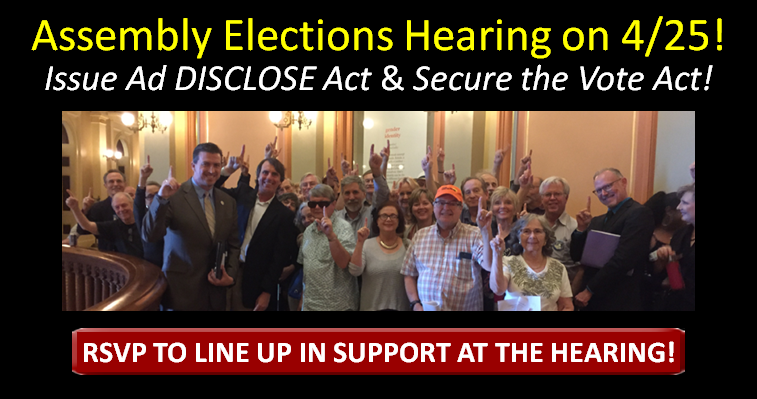 Build on Our Historic Victory for the California DISCLOSE Act! Clean Money Rolling against Big Money! 7 of 7 Clean Money Priorities in 2018! VICTORY! 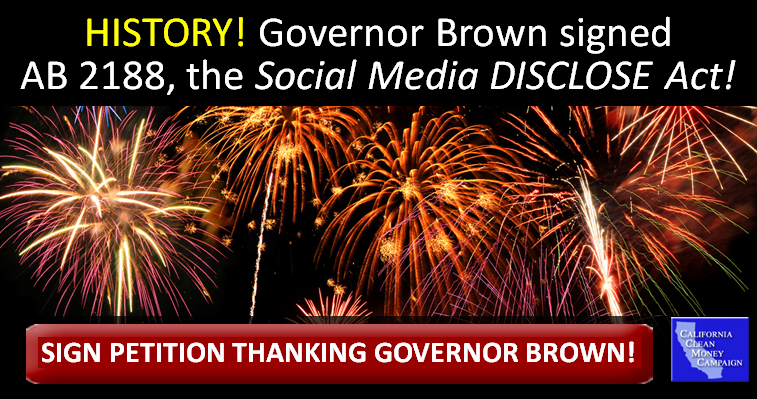 Social Media DISCLOSE Act (AB 2188, Mullin). Makes ads on Facebook, Twitter, etc. show top 3 funders! VICTORY! Restore Net Neutrality to CA (SB 822, Wiener)! VICTORY! Stop Abuse of CA DISCLOSE Act (AB 2155, Mullin). VICTORY! One Website With All Electeds (AB 2707, Mullin). VICTORY! Initial Funding for Open-Source Paper Ballots. VICTORY! Risk-Limiting Election Audits. (AB 2125, Quirk). AB 249, California DISCLOSE Act, Signed in 2017! READ ABOUT the strongest on-ad disclosure law in the nation — now law! Authored by Assembly Speaker pro Tem Kevin Mullin and sponsored by the California Clean Money Campaign. 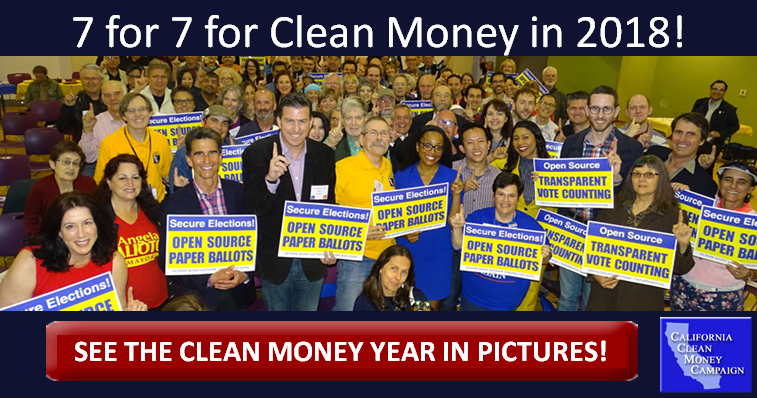 3 Top Clean Money Bills Passed in 2016! VICTORY! 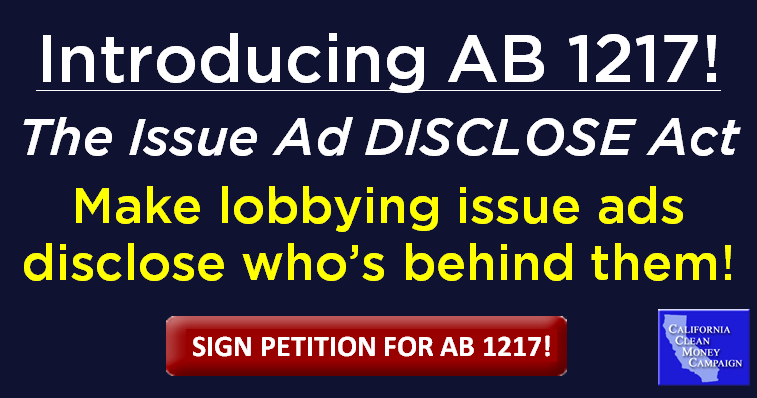 SB 1107 (Allen), which Clean Money sponsored, opens the door to public financing of campaigns in California! Victory news. VICTORY! 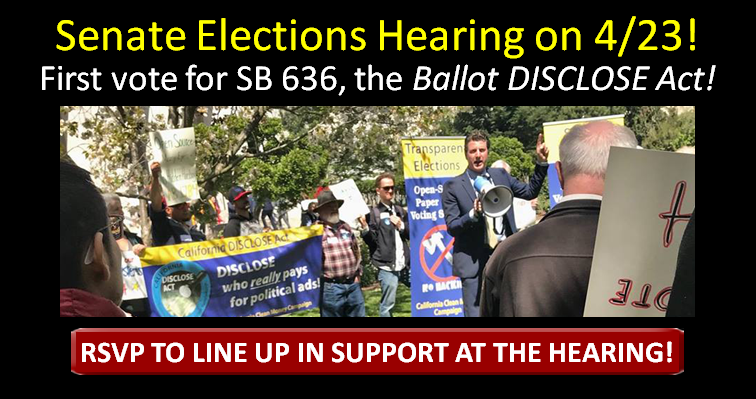 SB 1349 (Hertzberg), new state disclosure website! VICTORY! SB 254 (Allen-Leno), put on the California ballot Prop 59, the Overturn Citizens United Act — which won! Sign petition! 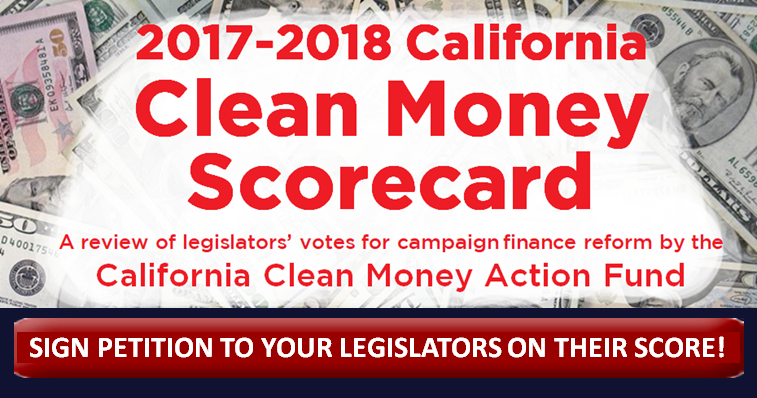 Become a member of the California Clean Money Action Fund to join the fight against Big Secret Money! What do you care about? The environment, health care, education, food safety, worker rights, civil rights, or fair taxes? Everything in our lives is dominated by billionaires and special interests that spend unlimited amounts of hidden money to buy ballot measures and elections. Clean Money activists are making California lead the nation against this threat. Historic California DISCLOSE Act Reveals Secret Money — But There's a Lot More to Do! Left: AB 249 author Assembly Speaker pro Tem Kevin Mullin speaks at "Give the DISCLOSE Act a Vote!" rally. Right: AB 249 Senate floor manager Senator Ben Allen, Clean Money President Trent Lange, and Assemblymember Mullin huddle outside Senate chambers on the day of the final Senate floor vote. 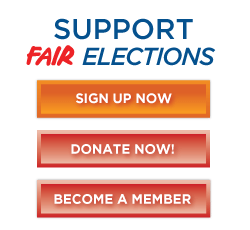 After a relentless 7 year grassroots campaign that a story on Salon.com called "... the biggest post-Citizens United effort to alter how campaigns are run in America...", in 2017 we developed and passed AB 249, the California DISCLOSE Act — the strongest political ad disclosure law in the nation. • Requires ads to show 3 largest funders of the ad in large clear type on a solid black background. No more fine print. Applies to all ballot measure ads and to ads about candidates paid for by outside groups. • Identifies original funders on ballot measure ads using first-in-the-nation using earmarking and tracing rules so ads must display true funders instead of misleading names, even when they try to hide behind multiple layers. We passed AB 2188, the Social Media DISCLOSE Act in 2018 — the first bill in the nation to require political ads on Facebook, Twitter, etc. show top their 3 funders! Pass SB 47, Petition DISCLOSE Act! Make initiative signature gatherers show voters an "Official Top Funders" sheet listing their top 3 funders. Make it easier for grassroots campaigns and activists by letting them print and staple initiative petitions themselves. 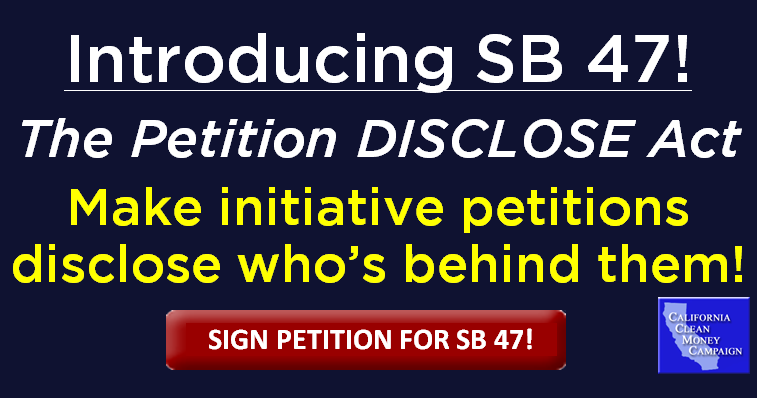 Sign the Petition for SB 47, the Petition DISCLOSE Act! Join a Clean Money Rapid Response Team! Become a Clean Money monthly member! Make a $3 donation (or more)!